Facebook was built on sharing. It’s a place to connect and show off your latest thoughts, photos, videos, interesting articles, and more. Every minute, Facebook users share 293,000 statuses, 136,000 photos, and 510 comments. With all that interaction, you’d think it’d be a great place to share opinions and influence others. Think again. Here’s how Facebook works and why it’s a poor place for opinions. With post-election unhappiness and horrid events happening across the globe, everyone on Facebook is weighing in. While many think they’re helping to shape their opinions, that’s not likely the case. The Facebook News Feed algorithm shows you a small number of the more than 1,500 updates most users connections share every day. This feed is shaped in a number of ways and it’s largely based on those you interact with most often. If you ‘Like’ a lot of posts from Sally, expect to see more posts by Sally in your news feed. Comment on a bunch of Jeff’s posts and you’ll see more from him in the future. Because of the way our interactions shape what we see in our feed, most users tend to see those at one of two extremes. People we totally agree with, and people we never agree with. We ‘Like’ and share positive comments with those we agree, so we see more posts from them. We also make argumentative comments with those we don’t agree with. Even though these comments aren’t in agreement, Facebook still sees them as an interaction with that person, so it shapes your feed to show you more from them in the future too. And that’s exactly why opinions shared on Facebook don’t do much. The things you share are either seen by those that already agree with you or those that strongly disagree. The people that may not engage often on such topics or don’t feel strongly one way or another are unlikely to see most of the things you post. Facebook shows them stuff from those they engage with most instead. Thanks to the way the News Feed shows our posts to those already in agreement with us, we’re given a false confirmation bias from the likes we receive. It’s like sharing your pro-bubblegum feelings in a room full of bubblegum enthusiasts and then believing most people feel the same way as those in the room. Even though the opinions we share on Facebook aren’t having much impact on those that see them, it certainly isn’t stopping most from sharing every article or update they see that supports their own beliefs. Once again, the Facebook News Feed makes sure that those shares are seen mostly by those that don’t need convincing. They simply ‘Like’ and move on without much thought. If you ‘Like’ baby pictures, Facebook will show you more baby pictures. If you like pro-taco articles, Facebook will show you more pro-taco articles (if you’re anti-taco, we can’t be friends). The Facebook News Feed again gives a false sense of confirmation bias by showing your shares to those most likely to engage and agree with them. This leads to users believing that their own views are shared by the majority of people, when the truth is that they’re simply shown to those that already agree. So why do we keep sharing if it has little impact on the opinion of others? Most likely, it’s because we’re addicted to sharing. Science has shown the feeling we get when we receive a ‘Like’ on Facebook is triggered by the same chemicals that drug users crave. When we first share something, we get a sense of joy thanks to the release of dopamine in the brain. This chemical is generally related to the anticipation of something exciting about to happen. When we get a ‘Like’ or comment, a release of serotonin is like a dog rewarded for good work with a treat. We love that feeling and are programmed to keep trying to get it. Although the entire platform is build for sharing, Facebook is no longer a place where sharing opinions is likely to reach anyone who will be persuaded by them. It’s really a platform for bringing like-minded people together (and sharing cat pictures). 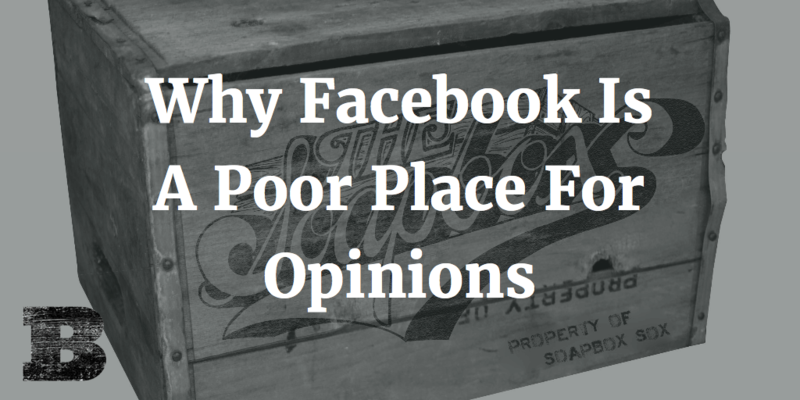 Just because Facebook isn’t a prime spot to share opinions doesn’t mean you have to stop. But it’s worth knowing why you’re shares are unlikely to change the world or even the minds of most you’re connected with. By knowing how Facebook works, we can better understand how our sharing is really received.